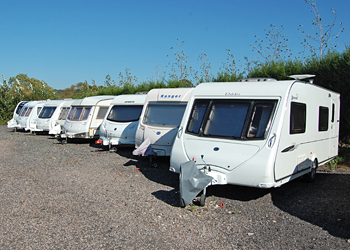 At Hunthay Farm we offer year round caravan storage within our secure compounds. We are members of the 'Caravan Storage Site Owners Association' and are proud to have been awarded their Gold award. Each of our caravan standings has a secure locking eye, ready for you to attach your own lock and chain. We have created a new caravan self storage compound which is now ready. We welcome bookings for caravans and motorhomes. All owners are given access by a keyless card system which provides constant monitoring of comings & goings. This service ensures that you have a secure, safe location to store your caravan, whilst still having the option to retrieve it whenever needed. Our existing caravan customers are finding the new proximity keys easy to use and the new compound spacious and secure. Please contact Jenny at Hunthay Farm to find out more about the caravan storage we offer to customers, whether you live locally or further afield and want to save fuel by storing your caravan in the beautiful East Devon & West Dorset holiday area. Many of our customers choose to store their caravan with us near their chosen holiday venue as this saves them towing costs, which is far better for the environment, keeps costs down and helps ensure their caravan is secure when parked. Ideal for personal, business, professional, commercial and domestic use. Long day access from 6am to 9.30pm prompt. 7 days a week. Conveniently located near Axminster, close to A35. Good security with CCTV and owners living on site. "Caravan Storage at Hunthay near Axminster"
"Caravan storage in East Devon"